Solomon Chapel UMC is not a large church. It has only about 60 members. But this summer the congregation is embracing a new mission to feed hungry children in the surrounding community. Members have opened their church in Orange Lake, between Ocala and Gainesville, as a site for the state's federally funded Summer BreakSpot program. 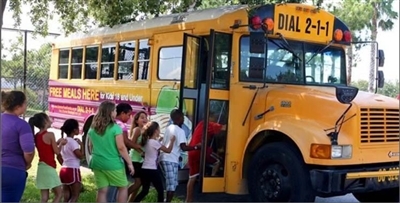 Children headed for a free meal at a Summer BreakSpot site board a bus in Pasco County. Photo from Florida Impact. From mid-June to Aug. 7, about 40 children are being fed daily lunches and snacks delivered from Bread of the Mighty Food Bank in Gainesville. The children also enjoy reading and arts and crafts activities from 11 a.m. to 2 p.m. Monday through Thursday. A church van picks them up each morning. "We have a lot of children in our community," says Pastor Anna Thomas. "We thought this would be a good fit for that and a good thing to be in mission outside the church." Church members spread the word through local newspapers, neighboring churches and fliers at area convenience stores. The congregation is multicultural and the children reflect that diversity, Thomas says. However, they all share the same challenge. The federally funded school breakfast and lunch programs end when classes let out for the summer. So children who qualify for free or reduced meals at school are left on their own and often find the cupboards bare at home. The federal Summer Food Service Program seeks to fill that gap by providing states with food and resources to serve meals to children age 18 and younger from June through August. Funding comes from the U.S. Department of Agriculture, and in Florida the program is known as the Summer BreakSpot. School districts, local governments, charitable organizations, community centers and churches are among groups that participate. "Churches are wonderful in hard-to-reach places," says Dr. Debra Susie, executive director of Florida Impact, a nonprofit advocacy organization and BreakSpot partner. "There usually is a church within a couple miles of a school." The Florida Conference is a founding member of Florida Impact, which began nearly 30 years ago. Florida Impact offers a tool-kit guide to churches, synagogues, mosques or other religious organizations to aid them in finding ways to help. Among the options are operating a BreakSpot site, but there also may be partnership opportunities with other churches, local governments or schools. In some cases, Susie says a summer camp may be held at a nearby school, but children go to a BreakSpot church for their meal. Federal regulations require meal sites to be within school districts and zones where 50 percent or more of the school-age children qualify for free or reduced meals. Program organizers must choose whether to serve breakfast or lunch. Anyone age 18 or younger is fed, regardless of income. "I just can't imagine what would happen without this program," Thomas says. "These kids wouldn't have food." In 2012, the BreakSpot program had 120 sponsors and 3,000 sites. The effort fed 10 million meals to more than 1.5 million Florida children. That represented about a 5 percent increase over the previous year. 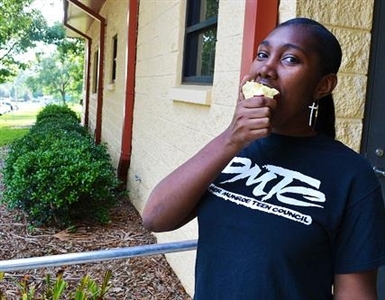 A teenager enjoys an apple at a Summer BreakSpot feeding site in Tallahassee. Photo from Florida Impact. Last year, the numbers climbed even higher, to nearly 3,500 sites, and meals served jumped to 12 million. Federal reimbursement was about $31.5 million, a 16 percent increase. Susie sees that as evidence of great need for the program. Yet she says the program probably is helping only 10 percent of children who are eligible for free meals. "We still don't reach the number of children who may be in need," Susie says. "And the concentration of hunger in children is in lower grades, the little ones." Among the challenges of administering the program are lack of transportation, low attendance in some areas and a heavy load of federal paperwork. Susie says participants must be committed to taking on these issues to ensure a successful program. Whether through the state's program or on their own, Florida Conference churches are taking on missions to feed hungry children. At Crawfordville UMC, the Sue Preacher Memorial Fun N Son Day Camp provided activities and meals to about 32 children daily for two weeks this summer. Preacher spearheaded the church's initial summer program, which began as a BreakSpot site. But church members found they preferred to craft their own program with church volunteers and local donations. When Preacher died in a car crash two years ago, the revamped program was named in her honor. "We kind of went a little bit different," says Fern Sloan, this year's organizer and the church's administrative assistant. 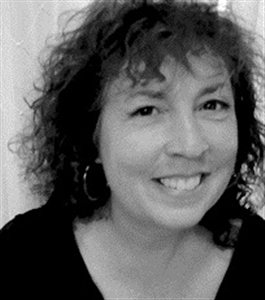 Sloan also has more than 35 years’ experience as a food service manager in the school system. Children received breakfast and lunch. Activities included a bicycle safety demonstration, helmet giveaway, visit from sheriff's deputies and county extension agent presentation on healthy eating. "We try to target the children who are in economically needy homes and for some reason are unable to attend day camp anywhere else," Sloan says. Last year there were children with autism in the mix. About 25 volunteers helped out. The church leased a school bus to pick up children and take them home. Thomas says Solomon Chapel plans to continue the BreakSpot program next summer. Members already are thinking of new ways to advertise the program and reach more children, some of whom have started attending Sunday school and worship services at the church. "It brings great joy," Thomas says. "They are really enthusiastic about it. We've seen a change in the children. We're able to help them, not only feeding them but doing reading and arts and crafts. “There is a need for this mission. We have not reached all of the children."